Williams Cuker Berezofsky is known for our relentless and successful battles on behalf of people exposed to toxic chemicals. For more than 25 years, we have represented individuals and communities who have suffered the serious –and all-too-often fatal –effects of noxious, polluted environments. Fracking and fracking-related accidents are presenting new problems that have the potential to affect homeowners and businesses. “Environmental toxic dangers are routinely downplayed by the authorities or the perpetrating source–so communities need to be concerned–even skeptical– about what they’re told. And they need an advocate,” – Mark Cuker, Esq. “It’s now commonplace, but we were among the first to really delve deeply into these matters, using experts and fashioning remedies that involved a lot of discovery, research, time and effort working directly with victims and communities. We were among the first to insist upon medical monitoring for environmental hazard victims,” – Jerry Williams, Esq. Williams Cuker Berezofsky is considered one of the foremost environmental litigation law firms in the United States. Since 1985, the firm has been committed to protecting personal, civil, consumer and worker rights. Led by name partners Mark Cuker, Esther Berezofsky and Gerald Williams, their team of twelve attorneys are nationally renowned for representing victims of precedent-setting environmental hazard cases. The firm’s high- profile toxic tort cases have been the subject of books, television news, feature programs and documentaries and discussed at seminars and conferences. Current and recent cases include representing citizens and first responders affected by environmental contamination and injury following the 2012 Paulsboro, NJ train derailment and the Toms River, New Jersey “cancer cluster,” as well as representing hundreds of property owners in Endicott, New York in claims that a former IBM manufacturing facility was the source of toxic vapor intrusion into their homes. The Pulitzer prize-winning book “Toms River: A Story of Science and Salvation” by Dan Fagin (2014) recounts the firm’s work to bring the matter to a successful resolution for residents. The firm represents clients individually and in class actions and mass torts, regionally and across the country in federal and appellate and state Supreme Courts. Williams Cuker Berezofsky is also distinguished for writing and submitting numerous, complex amicus curiae briefs to the U.S. Supreme Court. WCB attorneys won landmark toxic tort cases that resulted not only in significant financial recoveries for our clients, but have established important legal precedents that have benefited individuals and communities across the country. WCB was recently honored by the New Jersey Environmental Council for excellence in Toms River Cancer Cluster and Paulsboro Train Derailment litigation. 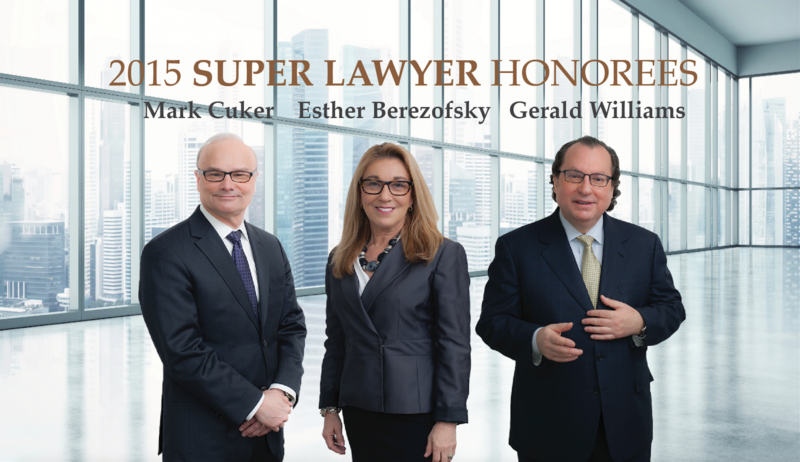 Super Lawyers honorees for the past 10 year, Williams Cuker Berezofsky serves clients nationwide and has offices in Philadelphia, Pennsylvania and Cherry Hill, New Jersey.